This is about as IKEA as it gets. The Swedish flatpack furniture giant is in the late stages of developing a line of furniture that’s made out of paper. That’s right: paper. Not cardboard. This durable stuff is a fascinating composite of repurposed pulp that can be molded into any shape. The craziest thing? It looks great. We’re not just talking about bookshelves for college dorm rooms. 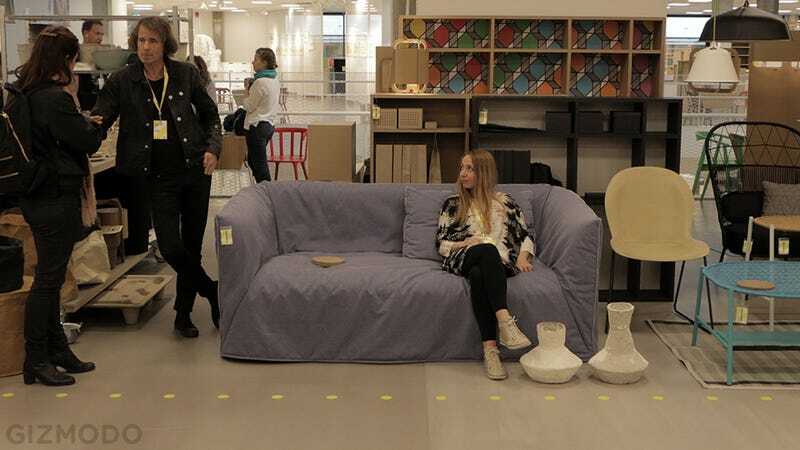 In two years, IKEA plans to launch a line of paper-made furniture that includes a sofa, a chair, tables, and some zany stools. And yes, there are some bookshelves, too. I recently saw—and sat on—prototypes for several of the pieces at IKEA’s headquarters in Älmhult, Sweden. The company was hosting its second ever Democratic Design Day and had set up a bazaar of sorts to show off its favorite projects for a group of international journalists. While some of the items we’d seen that day were headed to stores later this summer, these projects had longer runways. Some wouldn’t be seen by the public for years. And, of course, there was always the chance that IKEA would decide to abandon the designs altogether. Note: So that I could attend this year’s Democractic Design Day, IKEA paid for my transportation, meals, and drinks over the course of four days. The company also gave me a free poster and a free tote bag—both of which I immediately gave away. Honestly, I felt a little lost in the melée of new patterns and decorative glassware, until I saw a relaxed-looking woman sprawled out on an odd-looking sofa. Her badge indicated that she was not a journalist—we seldom look relaxed—but an IKEA designer. I looked around at the booth, which somehow resembled a deconstructed apartment. There were woven tables, odd shelving units, a rough-looking chair that resembled the legendary Eames molded plastic chair. And there were chunks of dried paper pulp here and there. “Can I help you?” the woman was now standing next to me, smiling. I’d later learn that she was Maja Ganszyniec, an acclaimed designer from Warsaw. I asked her if she was with IKEA, just to be sure. She nodded. I asked her what all of the items had in common. “They’re all made of paper,” Maja said. And I didn’t believe her! I asked how, where, why, as if she’d just showed me a smartphone made out of corn. Maja went on to explain how she and her collaborator on the project Michael Nickolic had developed a new process that enabled them to pressure mold paper into hyper resilient forms. You’ve probably seen molded paper before, but this stuff is rock solid. Well, it’s as solid as plastic but quite a bit lighter. Michael said that the new process was not dissimilar to making egg cartons out of paper pulp. They just took it to a new extreme. IKEA’s serious about this new paper project. “We have built factories around it,” he told me. The first of them are in Sweden, but IKEA plans to send its new paper furniture around the world. The current challenge, the two designers explained, was purely logistical. During my time at IKEA, I’d learn that this was almost always the biggest challenge. IKEA likes to source materials near factories and make the shipping process as efficient as possible. Inevitably, Michael said, the company “aims for the lowest price in each category.” The paper furniture category will be very low, with some pieces costing just a few dollars. The global launch is planned for May 2017. So far, it’s unclear which of the disparate pieces will make it to the showroom of your local IKEA store. The team is still perfecting designs and cycling through prototypes. I sat in the paper chair—the one that looks like an Eames piece—and it felt pretty damn good. I knocked on the paper bookshelves, and they felt sturdy. I picked up some funny stools covered in a material that Michael said was similar to the fake leather patch on the back of jeans. I sat on the sofa, it was plush. I ran my fingers along the fabric. It felt soft, like a well washed denim. “Well,” Maja pulled the cover back to reveal a metal frame. “This is just for show.” The upholstery would be fabric that may or may not contain paper. The frame was created as a model of what the final sofa would look like. Maja showed me drawings of the current design. With cushions and the not-all-paper cover, the sofa reminded me of a plush baseball glove. The frame itself, however, resembles an elongated Eames molded plastic chair with arm rests. But it’s lighter somehow. It seems to float. The all-paper sofa would be beautiful enough without a cover. Now, IKEA just needs to figure out how to source, manufacture, and ship several million of them—in flat packs, of course.